When you are rushing for work and preparing your kids for school, you need to cook in a quick way. Of course you can’t compromise with health by eating outside every day. To cook fast and healthy, a pressure cooker is your best companion. However, if you are not taking proper care while cooking in it, it can turn into your worst enemy. By covering every surface of your kitchen with spray and even on the ceiling, it can explode and cause accident. While buying, you need to think about a few matters. Pressure cookers are generally made of aluminium or stainless steel. These utensils are best when made of stainless steel. It becomes sturdy and handles excessive heat and pressure. Size of your pressure cooker depends on your requirements primarily. Generally, most bought size of cooker is 6 quarts. Bigger cookers are better. They provide you with the space for the juice and minerals of the vegetables or food that is cooking inside it. Wide cookers are preferable as they will give you bigger cooking surface than taller models. 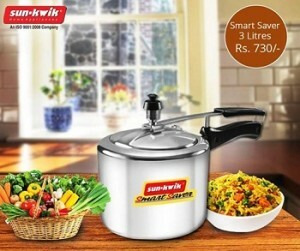 • As it cooks in less time with water, it is able to hold up the vitamins of the food intact. The food cooked in it is healthy. • It is time saver. When you are in hurry, it can cook in just no time. • Pressure cooker is energy efficient. As it takes a little time to cook, the amount of energy it consumes for cooking is lesser than any other cooking method. • It helps to maintain a cooler and cleaner kitchen. • Check your pressure cooker always before cooking. • Regularly clean your cooker. • Don’t fry food in your cooker. • Use exact amount and quantity of ingredients in your cooker. Various types and sizes of pressure cooker are available in the market. With regular pressure cooker, the demand of induction base pressure cooker is widely available in the market. Choose your type and size from the wide variety.